The first word that comes to mind when we think of diamonds? Sparkle. The experts call it light performance – or the stone’s appearance from the top – and that’s precisely what diamond cut grades measure. When buying an engagement ring, diamond cut is the factor that will most affect its visual impact, thus its value, making it the most important thing to consider when choosing your stone. 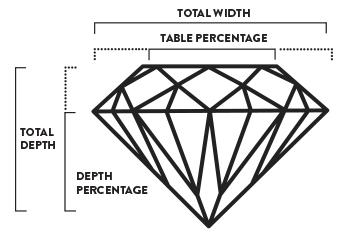 Many confuse diamond cut and diamond shape. The shape refers to the style of a cut stone, whereas diamond cut refers to the proportions of the facets that make a stone sparkle. Stonecutters use diamond cut proportions to maximize the amount of light that emanates from the top, or “table,” of the stone. Cuts that are too shallow or wide for their size lose light at bottom, whereas overly deep cut diamonds lose light at their sides. Proper ratios enhance surface brilliance and prismatic “fire,” and play up reflective symmetry. When choosing your stone, diamond cut is what will most affect its ooh-ahh factor, as we like to call it.